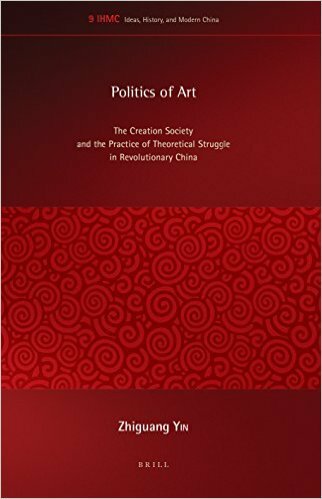 Politics of Art is an innovative study of the political significance of the Creation Society (创造社), a celebrated literary society of 1920s China. Among its many insights, for example, it introduces readers to intriguing connections, such as that between the Frankfurt School and the Creation Society, via the Japanese Marxist Fukumoto Kazuo (p. 16). Inspired by the scholarship of Benjamin Schwartz, Arif Dirlik, Paul Pickowicz, Elizabeth Perry, Wang Hui, Rebecca Karl, and Nick Knight, among others, Zhiguang Yin sets out to “demonstrate the origin and value of theoretical struggle in China’s modernisation history” (p. 4). He is mainly concerned with the following questions: “How can theoretical struggle facilitate the politics of emancipation? How can the intellectuals truly engage in the society and represent and/or reflect the needs of the people?” (p. 4). Such questions are at the center of modern Chinese intellectual history and contemporary scholarship on that history. As a book concerned with politics and history, Politics of Art offers informative, broad-stroke delineations of general intellectual trends with regard to the Creation Society’s membership and their activities. Yin examines the theoretical debates involving the Creation Society as a two-fold process: first, as a way for society members to position themselves as useful individuals contributing to social transformation and revolution; and second, as a way to construct their own identity as a vanguard class that would in turn be responsible for stimulating class awareness within the emerging proletariat (p. 11). That is to say, Yin takes on a socio-political perspective and reads Marxist literary theory as a mode of political engagement (p. 25). Chapter 1 describes the intellectual social circles that conditioned the gestation of the Creation Society. Yin provides the social backgrounds of the Creation Society members, emphasizing their provincial upbringings in China as well as their shared experiences as foreign students in Japan. KMT exiles who fled to Japan after the failed Second Revolution of 1913, many of whom became involved with the local student community, and the widening circle of the Young China Association, together helped to foster the official establishment of the Creation Society in Shanghai, circa the early 1920s. The author concludes the chapter by highlighting that “Guo [Moruo]’s early connections with the YCA [Young China Association] thus helped lay the groundwork for the Creation Society’s emergence as a competitor in the Chinese publishing market of the mid-1920s” (p. 55). But what about Tian Han’s role in this process? Tian was a key member of both the Young China Association and the Creation Society in their early stages, and his central role in this process deserves closer attention than Yin affords it. Chapter 2 focuses on the socio-political context of Creation Society intellectuals’ “self-recognition.” It outlines the social milieu of Taishô Tokyo in which their social thinking was largely shaped. It then follows the Creation Society members back to China and describes how they competed for social and cultural capital during the early period of the Society. Their sense of being oppressed pushed the intellectuals of the Creation Society to assume a proletarian identity. However, using published data from the Second Historical Archives, Yin demonstrates in the last part of this chapter that the income of many Creationists was significantly higher than average working class people in China at the time and that the Creationists’ self-fashioning of a proletarian identity was indeed more of a symbolic claim than a social reality (p. 85-86). Chapter 3 highlights the “Mission of Literature” and the political activities of the Creation Society. This chapter holds great promise for the writing of a revisionist history of the Creation Society, whose members have frequently been associated with the motto “art for art’s sake” by historians of modern Chinese literature. Yin’s introduction to the topic, however, is somewhat confusing, because he claims that the Creation Society’s opposition to the Literary Association lies in its insistence on “art for life’s sake,” a position that foreshadows their later engagement in “revolutionary literature” (p. 87). Still, the chapter constitutes a considerable contribution by tracing how cosmopolitan idealism and national salvation fused to form the literary stance of the intellectuals of the Creation Society in the mid-1920s (p. 91). The political support of the KMT Guangzhou government and the teaching positions offered by Guangzhou University fostered a sense of optimism in the circle of intellectuals gathered in “the Moscow of China” (p. 107), and further enabled their transformation into self-conscious “revolutionary writers.” The chapter goes on to narrate these writers’ disillusionment after the KMT’s anti-communist tendencies began to surface in 1926, how the meaning of “revolutionary literature” consequently began to shift with the changing socio-political context of its time, and how the CCP’s and the KMT’s involvement and intervention in the debate pushed the idea of revolutionary literature into a new political stage (p. 127). Chapter 4 examines the central struggle between the “two souls”—the proletarian and bourgeois—as constructed by Creation Society intellectuals in theorizing the process of class transformation. The “reflexive concept” (p. 135) of “proletarian revolutionary literature,” Yin argues, became a key focal point in the Revolutionary Literature debate, and has sometimes been retrospectively marked as the starting point of the Creationists’ “transition to Marxism” (p. 139). The chapter goes on to critique the revolutionary literary writers’ assumed revolutionary legitimacy, which they based on social evolutionary discourse. It highlights the issues of subjectivity and self-representation in their endeavor to define proletarian revolutionary literature and assert themselves as its representatives. Finally, through a detailed discussion of the misinterpretation and reinterpretation of Marx’s term “Aufheben” (also spelled “Aufhebung”) in the Revolutionary Literature debate, Yin concludes the chapter with an emphasis on the importance of the dialectical relationship between the old and the new and the process of self-criticism in the history of twentieth-century Chinese revolution. In the end, Yin leads the reader beyond the Creationists’ promotion of proletarian literature to a desire for national salvation, by reframing the literary-historical perspective toward what he calls “the hybrid nature of the Chinese proletarian art movement” (p. 182). Through a spirited discussion of the dialectics of the Creation Society members’ theory and practice, and a detailed historical combing of the cultural policy of the KMT and the political propaganda of the CCP during the second half of the 1920s, Chapter 5 drives home the book’s central argument about the politics of literature and arts at the time, by highlighting the central role of theoretical struggle. The contribution of such theoretical struggles, put succinctly by the author, lies in the fact that, “As a result of this intellectual controversy, formerly alien concepts in Marxism began to have a wider readership. The seemingly outdated topic of revolution resurfaced in Chinese society” (p. 186). In the Conclusion, Yin focuses on the Chinese “revolutionary tradition,” a subject that has recently been revived by Elizabeth Perry’s book Anyuan: Mining China’s Revolutionary Tradition (p. 226). He offers his take on revisiting the communist revolution in the context of present-day China, where it is often met with either outright rejection or dogmatic reassertion of its principles and practices. He argues that a revaluation of China’s revolutionary tradition could “revive the dialectics from its indoctrination” (p. 229) and that the true legacy of twentieth-century Chinese revolution lies in how theoretical struggle, based on a shared concern for national salvation, enabled the internationalization of foreign ideas and the transformation of Chinese classical concepts. In this context of reclaiming a revolutionary tradition, Wang Hui’s critique of contemporary “depoliticized politics” in the PRC lends political significance to Yin’s study of the revolutionary legacy of the Creation Society. Contrary to the Post-Cultural Revolution trend of biding farewell to revolution, Yin views the history of revolution and enlightenment in China “as two sides of a coin under the modern mantle of rationalism” (p. 4). Taking a different approach from “dogmatic” studies focusing on the CCP as a political force in the Chinese revolution, Yin’s very choice of focusing on the Creation Society and those intellectuals who “converted” to Marxism and later joined the CCP (p. 9), is at once innovative and, to this reviewer, slightly problematic. Yin’s innovation lies in treating a celebrated literary group politically. However, his focus on the politics of the Creation Society has the unintended consequence of reducing a diverse group of intellectuals and their writings to a handful of predetermined narratives. If Yin had paid more attention in his study to those Creation Society members whose intellectual and political trajectories do not fit neatly into such predetermined narratives, Zhang Ziping and Tian Han, for example, it would have in fact enriched rather than undermined his argument. A lesser concern has to do with one of the book’s many strengths—the way it foregrounds the power of the Creation Society as a new force reclaiming territories already occupied by “established” powers of the time, including intellectuals and groups associated with “the May Fourth generation.” However, rigid generational demarcations and categorizations of social groups such as “the May Fourth generation” and “intellectuals of the Creation Society” (p. 27, p. 29-30, p. 53) were in reality never so clear-cut; it would have better served his arguments for Yin to have problematized such broad-brush designations. The author should be commended for his use of extensive Chinese-language and English-language secondary sources. He introduces a wide range of excellent Chinese-language scholarship to the English-speaking world, and facilitates meaningful and extensive dialogue between the Chinese- and English-language scholarship. On the other hand, over-reliance on Chinese- and English-language secondary sources (including Chinese translations of Japanese and Russian materials and English translations of German sources) raises questions about the mediated nature of these sources. The author should have at least touched on the issue of translated sources in his discussion of the cosmopolitanism of the Creationists and the transnational flow of Marxist theoretical terminologies. 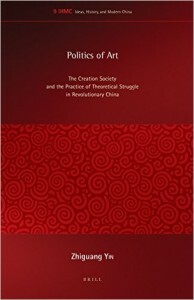 These minor concerns aside, all in all, Politics of Art makes an important contribution to our understanding of the history and historiography of some of the centrally important questions in twentieth-century Chinese intellectual history, such as the relationship between the intellectual and the people and the dialectics of theory and practice. Students and scholars interested in the political engagement of modern intellectuals, both in China and elsewhere, will have to wrestle with this book—theoretically.